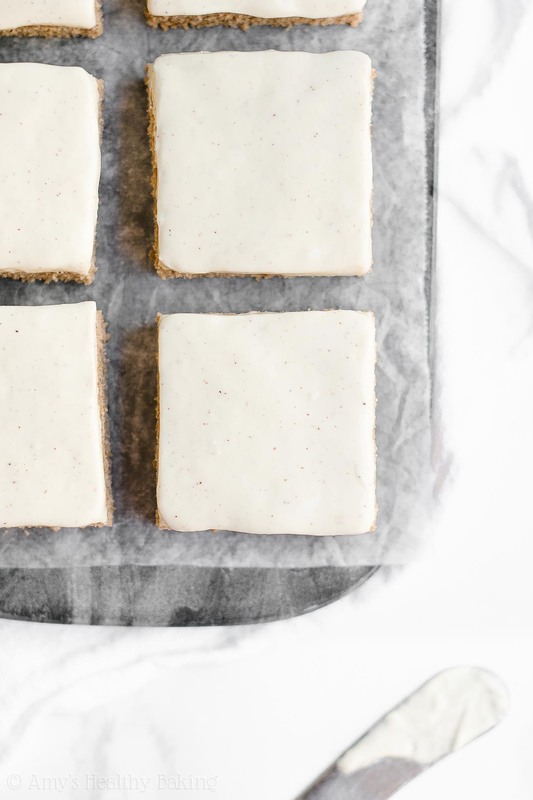 Learn how to make sweet cinnamon cookie bars with cream cheese frosting—entirely from scratch! They taste like cinnamon rolls! Only 82 calories! A couple of years ago, I flew to Michigan for a retreat with other food bloggers. We started in Grand Rapids and spent our first 24 hours exploring the city before driving out to Lake Michigan for a long weekend. On our first morning in Grand Rapids, we walked a few blocks away from our hotel to a cute café for brunch. The interior was decorated like a charming French bistro, including brick walls and pillars covered in mosaics. After looking over the menu for a long time, we each placed our brunch order. Shortly after, the waiter brought over our drinks, and he also set a gigantic cinnamon roll on the table as a breakfast “appetizer” on the house. I had never seen a cinnamon roll so big! At least three inches tall and five inches wide, it came in a black skillet topped with another inch or two of cream cheese frosting piled on top. We had to use a fork and knife to cut slices to pass around the table! After everyone around me took their first bites, it was unanimous: that cinnamon roll was amazing! Warm, cozy, sweet, gooey, doughy… True cinnamon roll perfection. Yet we all agreed an entire one would be a little too much sugar first thing in the morning—and should probably count as dessert instead! So I took those same sweet cinnamon roll flavors and turned them into these Healthy Cinnamon Roll Cookie Bars! 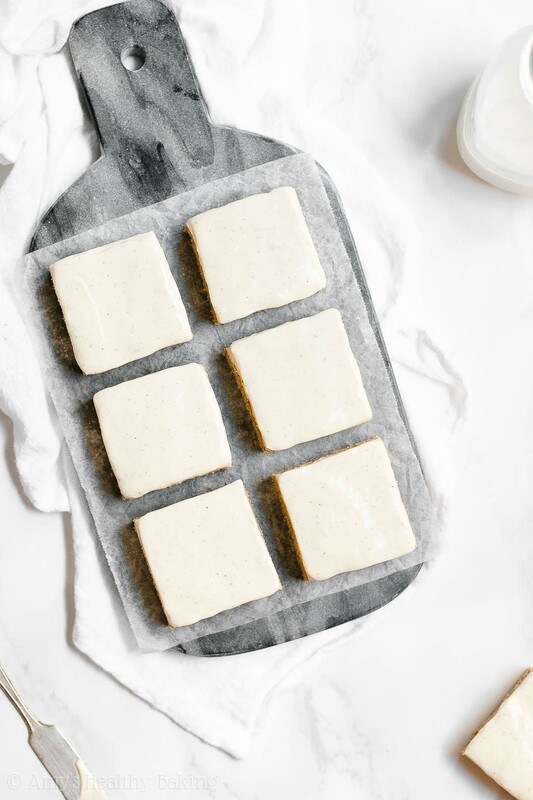 The chewy sugar cookie base has lots of cozy cinnamon, and the sweet cream cheese frosting is the perfect finishing touch. 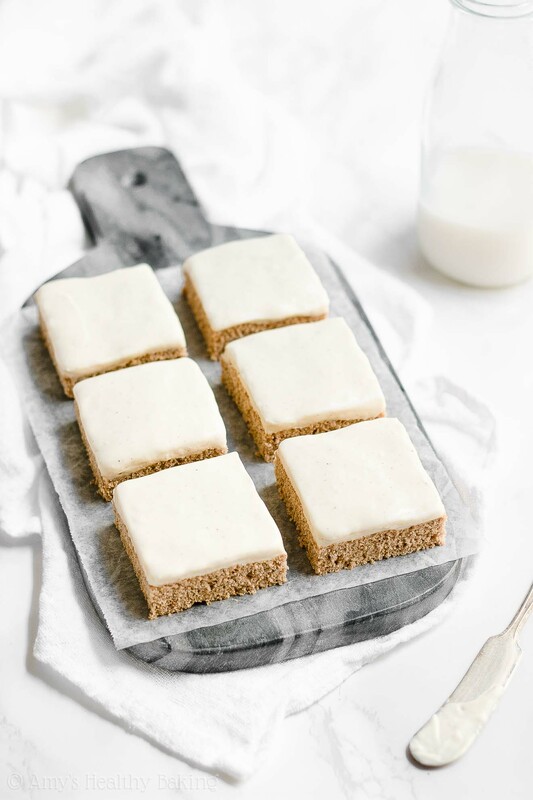 Yet unlike that original cinnamon roll… These healthy cookie bars contain no refined flour or sugar, and they’re just 82 calories! 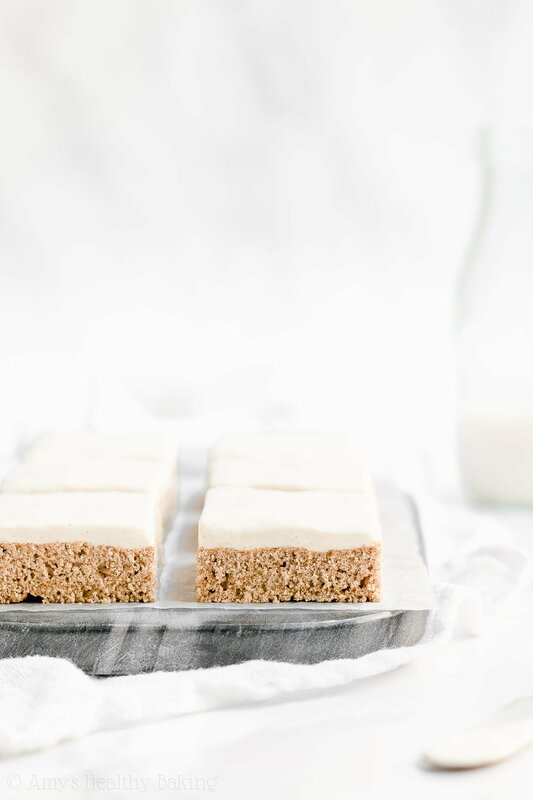 So maybe… Eat these healthy cinnamon roll cookie bars for breakfast and save that gigantic Cinnabon-style cinnamon roll with its extra frosting for dessert instead?… ? Let’s go over how to make these healthy cinnamon roll cookie bars! You’ll start with white whole wheat flour (like this!). Yes, that actually exists—and it’s not a combination of white (aka all-purpose) flour and whole wheat flour! Instead, white whole wheat flour is made by finely grinding a special type of soft white wheat (hence the name! ), whereas regular whole wheat flour comes from a heartier variety of red wheat. 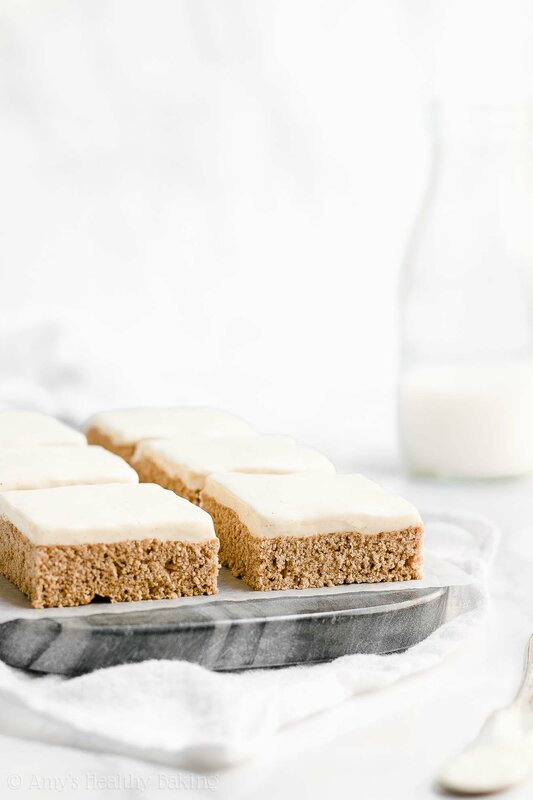 They both have the same health benefits, but white whole wheat flour has a lighter taste and texture… And that lets the chewy texture of these cookie bars truly shine! Hint: I’ve also included a gluten-free option in the Notes section, if you prefer! To make these healthy cinnamon roll cookie bars taste like cinnamon rolls, you’ll also whisk lots of cinnamon into the flour. This is my favorite type of cinnamon. It’s the only one I use in my baking now! It has a stronger, fuller, and slightly sweeter flavor than regular cinnamon. I highly recommend it! Whereas many traditional recipes call for a full stick or two of butter, these healthy cinnamon roll cookie bars only require 2 tablespoons of butter. Yes, that’s it! That really helps keep these low in calories! ? 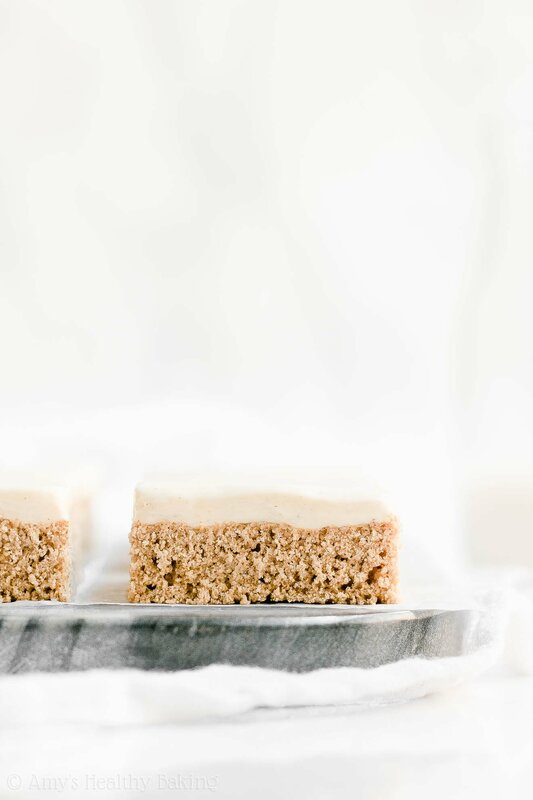 Then to make these healthy cinnamon roll cookie bars taste as buttery and chewy as traditional cookie bars, you’ll (a) melt the butter to boost the chewy texture and (b) add more vanilla extract. 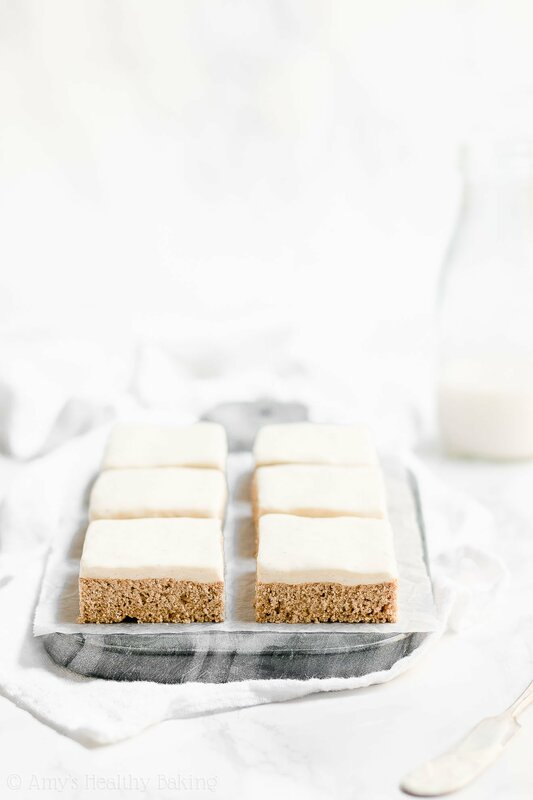 Additional vanilla enhances butter’s rich flavor, so these healthy cookie bars taste just as rich as regular ones! To sweeten your healthy cinnamon roll cookie bars, you’ll use a combination of honey and vanilla stevia (this kind!). If you only used honey, that would add too much liquid to your cookie dough… And your cookie bars would taste bready or cakey instead of chewy! So that’s why you’ll use half honey and half stevia! Stevia is a plant-based, no-calorie sweetener that contains nothing refined or artificial (aka it’s clean eating friendly). It’s also highly concentrated. You just need 1 teaspoon for these cookie bars—and that definitely prevents you from adding too much liquid to your cookie dough! Once you’ve spread your cookie dough into the pan and popped that in the oven, it’s time to make your healthy cream cheese frosting! You’ll need Greek yogurt, light cream cheese, instant pudding mix (this kind! ), a bit more vanilla stevia (this one! ), and a hint of cinnamon (remember, this is my favorite!). The instant pudding mix is actually a key ingredient in this healthy cream cheese frosting! The Greek yogurt adds more moisture to the frosting than traditional cream cheese frosting recipes… So the instant pudding mix thickens the frosting so that it has the same consistency as regular cream cheese or buttercream frosting! Enjoy! And when you make your own, remember to snap a picture and share it on Instagram using #amyshealthybaking and tagging @amyshealthybaking IN the photo itself! (That guarantees I’ll see your picture! ?) I’d love to see your healthy cinnamon roll cookie bars! These sugar cookie bars truly taste like cinnamon rolls! 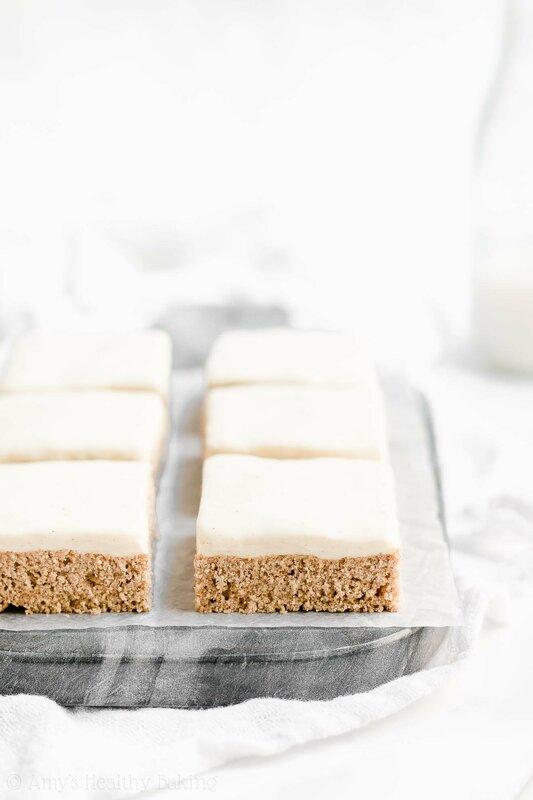 There’s plenty of cinnamon in the chewy cookie bar base, and the sweet cream cheese frosting adds the perfect flavor complement. These cookie bars will keep for at least 3 days if stored in an airtight container in the refrigerator. To prepare the cookie bars, whisk together the flour, cinnamon, baking soda, and salt in a medium bowl. In a separate bowl, whisk together butter, milk, egg white, and vanilla extract. Stir in the honey and vanilla stevia. Add in the flour mixture, stirring just until incorporated. While the cookie bars bake, prepare the frosting. Beat the Greek yogurt, cream cheese, instant pudding mix, cinnamon, and vanilla stevia together using an electric hand mixer or stand mixer for 2 minutes. Cover the bowl with foil, and chill for at least 2 hours. Whole wheat pastry flour, regular whole wheat flour, or all-purpose flour may be substituted for white whole wheat flour. Any milk may be substituted for the unsweetened nonfat milk. This is the vanilla stevia that I use (and you'll also use it in all of these recipes of mine!). I buy mine online here because that's the best price I've found. You cannot substitute additional honey for the vanilla stevia because the cookies require a precise balance of wet and dry ingredients. However, you may substitute ¾ cup (144g) coconut sugar (or brown sugar or granulated sugar, if you aren’t concerned about keeping these cookies clean eating friendly) for both the honey and stevia, but the cookies will appear “speckled” if using coconut sugar because it doesn’t dissolve as well. Mmm, these look delicious! I love cinnamon, I love sugar cookies, and I love cream cheese frosting. Did you make these just for me haha? P.S. I need the name of that cafe so I can also get myself a giant cinnamon roll! I share all about that restaurant and my trip here! 🙂 I’d love to hear what you think if you try these cookie bars! Hi Amy! I’m new to your recipes and made these today. I thought I followed your recipe as you indicated, though I did not have vanilla stevia and used 1 tsp of powdered stevia in place of the vanilla stevia. They don’t seem to be as chewy as you describe and a bit more dry. I felt like the recipe needed more moisture. Though quite tasty. Thoughts? I really appreciate your interest in my recipe Penny! I’m happy to help solve that texture issue. 🙂 How did you measure the flour? Did you use a kitchen scale or measuring cups? If the latter, can you describe in detail how you measured? Also, did you make any other modifications besides the powdered stevia? And what brand and product of powdered stevia did you use? (Every stevia brand and product tends to have a slightly different sweetness level!) Once I know your answers to all of those questions, we’ll have a much better idea of the culprit and how to fix that issue if you decide to make these cookie bars again! I did measure the dry ingredients with a kitchen scale. I’ve since gotten the liquid stevia you suggest and am going to attempt these again. I am also going to weigh the butter and milk as I did not do that in my first attempt. I will let you know my results. Enjoy your recipes and the science behind them ? I’m so honored that you’d like to try making them again Penny! That means a lot to me. I can’t wait to hear how they turn out! 🙂 I think weighing the butter will also help a lot. However, do not use your kitchen scale for the milk! Although your scale probably has an “ounces” option, that’s actually for dry ounces, not liquid ounces. Kitchen scales can only measure weights (grams), not volumes (mL), so always use measuring cups for any liquids like milk, water, etc for the best results!